Broads Tours - Day Boat Hire at Broads Tours01603 782207work Boat TripsFor the independent explorer who wants to discover the Broads at their own pace, Broads Tours operates a fleet of self-drive day boats and day cruisers. Standard day boats seat up to 8 people, are simple to operate and have a canvas cabriolet style cover to protect you from the elements. Available to hire by the hour up to a full day on a first come first served basis. We have one standard day boat fitted with a wheelchair lift. Max weight 300kg. This boat seats up to 5 people, and is available for a minimum hire of 3 hours. Large Electric Boat has seating for up to 11 people. Electric propulsion provides a quiet and environmentally friendly alternative to the diesel engine. Available for a full day hire only (9am - 5pm). Booking essential 01603 782207. 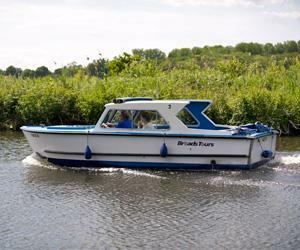 Broads Tours also operates a fleet of double decker passenger trip boats. For the independent explorer who wants to discover the Broads at their own pace, Broads Tours operates a fleet of self-drive day boats and day cruisers. Self drive day boats available from 1st April until 31st October.